If your kid loves music the way most kids do, you’ve probably considered signing him or her up for music lessons. 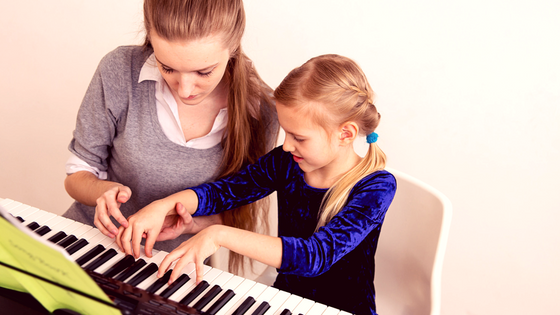 Recent studies have shown that kids who study music can benefit in multiple ways, so if your child has an interest in learning to sing or play an instrument, music lessons are a great idea! Here are some important things to consider before signing up! 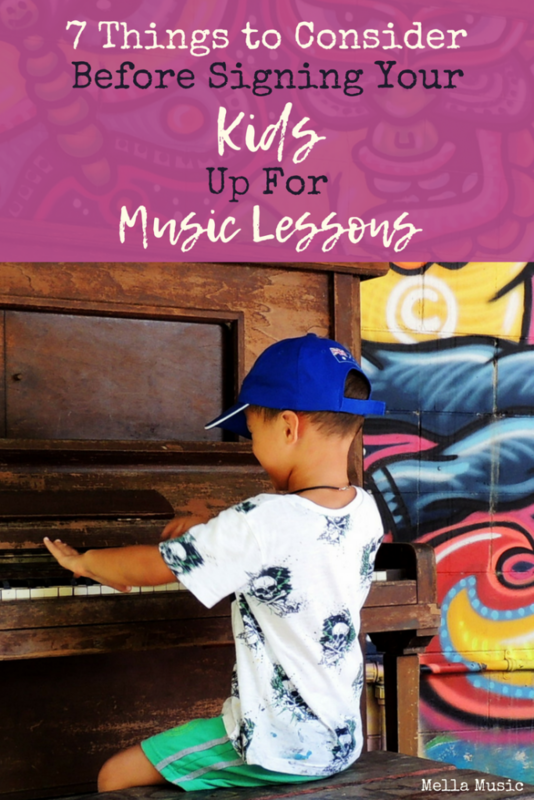 Many parents don’t realize just how much music lessons can do for their child. Learning music can improve their skills in math, memorization, and listening. It also helps young brains to develop and learning an instrument improves motor skills and coordination. Learning music can also build self-esteem and teach kids about time management and teamwork. Not only that, playing an instrument or singing is a great way to relieve stress and it gives kids a constructive way to express themselves. Kids who practice music and singing often do better in school because they learn about patience and self-discipline. Adults who learn music as children are often more successful. They have a better work ethic and they understand that hard work pays off. They understand that they have to start at the beginning and work their way up. Also, they have better social and communication skills. The perfect age to start will vary from child to child. The key is to find a music program that is appropriate for your child’s age and interests. Does your child respond to music by singing, clapping, or dancing? Children two years old and even younger can be taught how to clap along with the beat of their favorite songs and identify rhythms. The younger your child is, the easier it will be for him or her to learn, so if they show an interest in learning, that’s when you should sign them up. For more formal instruction in singing or learning an instrument, 5 is usually a good age to start. By that age, children are usually able to sit still longer and focus better. However, a child who doesn’t want to learn how to sing or play an instrument shouldn’t be forced. Forcing your child to learn is unlikely to lead to a love of music. If your child fights you every step of the way, waiting until he or she is a little older might help. Be sure to consider the age and physical limitations of your child. Don’t choose an instrument that is too heavy or too large for them to play properly. Violin and piano are great instruments to start out with, especially for children under six because they help to develop a foundation for other instruments. If your child has a strong desire to learn a certain instrument, talk to their music teacher to see if it’s a good choice for their age. There are ways to avoid annoying the neighbors and the rest of the family during music practice. You can set up a practice room with DIY soundproofing with thick rugs and heavy curtains, or start your child out on an instrument that can be played through headphones. Good communication can also solve a lot of problems, so talk to your neighbors and family to work out the best practice times before your child starts lessons. School-aged children are often involved in sports and clubs that take up a lot of their free time. Make sure your child can fit music lessons in without being too stressed or letting his schoolwork suffer. If he or she already has a full schedule, some tough decisions about what’s most important will have to be made. While the majority of the time commitment will fall on your child’s shoulders, you will still need to make sure he practices and attends his lessons. You will also need to drive him back and forth to lessons and find something to do while he’s there. Thanks to modern technology, your child can take his lessons online from a qualified teacher, right in your living room, if you don’t have the time to drive him back and forth. Depending on where you live, you might have several options for where your child attends his lessons. The teacher may teach from their home or a studio, or they may come to you. Be sure to consider travel times carefully to make sure you can have your child at their lessons on time. Visit the location to see if it will be a good place for learning. If there’s a lot of activity and distractions, consider your child’s personality and whether or not he or she will be able to focus. Music To Your Home’s NYC music lessons can be taken in person at their studio or online from anywhere in the country, so they’re a great option for anyone wanting to learn. Space is an important factor for some folks. A piano or drum set is going to take up a lot more room than a violin or flute. A digital piano that has weighted keys could be a good solution for children learning piano. The point is to figure out where the instrument is going to be played and stored before you bring it home. Cost may be the most important factor for some folks. Purchasing an instrument can be a big expense, but you do have some options. Consider renting an instrument from a music studio or purchasing one used from Craigslist. Some schools might even have loaner instruments your child can use for a while. Books and sheet music can often be found online, too. The cost of the lessons themselves is another consideration. Online lessons are often cheaper than in-person lessons, so be sure to look into that option. Giving your child the gift of music is something he or she will take with them for their entire life. With some careful planning and creativity, every child should be able to learn an instrument if they desire to do so. Vincent Reina began teaching piano lessons as a high school student and has continued to do so ever since. He received a Bachelor of Music Degree in Piano Performance from Purchase Conservatory. He then earned a Masters of Arts in Teaching Music from Manhattanville College. Today, Vincent is co-founder of Music To Your Home, a New York City-based music school. He’s the proud winner of many significant piano competitions, including the Westminster Choir College Artistic Excellence in Piano Award. I like your advice to find a music program appropriate for your child’s age and interests based on what they respond to is a good idea. Once you know what you want, such as vocal or piano lessons, it would probably help to start researching local instructors. After you’ve researched them and narrowed down the list, you might want to call or meet with the instructor in order to ask questions about their lessons and talk about your child so that you can make sure they’ll be able to teach them the skills that will benefit them. Yes definitely! I think it’s a great idea to meet the teacher to make sure your child gels with them. Having a teacher they don’t like could turn them off of that instrument entirely which we definitely don’t want! Thanks so much for your thoughts! Thanks for pointing out that we should have a plan ready for the type of instrument that they want to learn because it can take up some space. This is true since my daughter wanted to learn piano which is bigger than other instruments. She just started being interested in it when her favorite artist played one at their concert that she watched. You could try a smaller keyboard if you want to start her out on it and see if she likes it! That way if she doesn’t stick with it, you haven’t taken up as much space as a giant regular piano 🙂 Best of luck to you and her! Thanks for this advice for signing up kids for music lessons. It’s good to know that you should try to pick an instrument that a child can easily play, like a violin or a piano. Not only that, but it could be a good way to introduce them to music at least so they understand basic principles if they want to learn more instruments. Great advice. I never thought about noise factor! I need to think about that when choosing the instrument for my kid, but all of them seem quite noisy. Haha my dad started drumming when he was a toddler – I think my grandma regretted it at the time but he does it professionally now! 🙂 I built a soundproof booth for my own vocal recordings, if you wanted to make a small one for your kid’s practice it might be worth it!